steve - do you own 'a noble friend'? "HUTCHINSON'S POPULAR AND ILLUSTRATED DOG ENCYCLOPAEDIA PART 33 1935" by Hutchinson, a first edition 1935. This superb large dog encyclopaedia was issued in weekly parts, this being part 33 (there where 56 weekly parts issued) an excellent large softback approx. 11" x 9" dog book - magazine. Each weekly magazine featured one or two individual breeds of dogs usually with one or two superb coloured art plates by famous artists of the time. 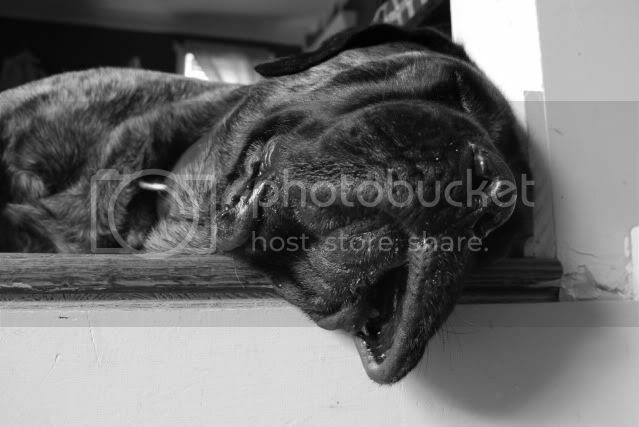 In part 33 which features a large colour art plate of a Mastiff, the breeds featured are the Mastiff. ANTIQUE MASTIFF DOG CALLED MONARCH WINDERMERE CUMBRIA CABINET CARD PHOTO COLLARA wonderful Cabinet Card featuring a large Mastiff dog, who wears a thick leather collar with a large lock fastening. The dog is identified on the reverse as "Monarch". The photographer was R & J. W Brunskill of Windermere, Cumbria, England. There is a great lot of 3 covers complete with letters documenting the story of buying a English Mastiff dog. The covers are from North Java New York Merchandise and Produce dealer in General Merchandise CW Davis to CE Denniston Dresden New York. The first letter is dated November 11 1895 and complains that $25 is much too much for an English Mastiff and that only $20 is affordable. The second letter is dated December 3 1895 that sent $20 for a male English Mastiff full blood 4 month old puppy weighing 40 pounds shipping the dog by American Express. The third letter is dated April 6 1896. It is a pitch for sales but the Post Script concludes the story saying that the dog weighs 120 pounds, is gaining weight every day, and is the best watch dog in town. Where do you find this stuff? Apparently I've been looking in all the wrong places because I never find anything! Ebay is a good source for stuff. But for other items, one must spend time in searching through many various sites. Can you list some good sites? When I go into eBay, I go to advanced search, put mastiff in the Keywords section at the top, scroll down to Location and go to worldwide, then I press the newly listed section so I do not miss anything and then search. I always check the newly listed and ending soonest sections daily. It is an illness. Thanks Janine! I loved all the pictures you sent me! For serious collectors, you'll need to peruse the tons of auctions that are both domestic & international. Thanks for the many heads up you have given me Steve. you can also contact book sellers and antique dealers directly. I got champions from a book dealer in the uk, he knew I was looking for mastiff books, he got a copy and he contacted me. I've also bought pieces directly from antique dealers, which is not the cheapest way to do things to say the least...and I've actually found a few in antique stores, sometimes you can find the nutcrackers or the (senior moment), very easily chipped plaster of some sort, brown, reclining mastiffs. I found the first piece I bought, a charcoal sketch, right down the road from where I live now. Virginia Wind (A/K/A ..V) visited the Museum today and was kind enough to have brought me additional info on the George Cole painting we recently added to the collection. The following will clarify and give more information on the background of the subjects in the piece. For additional information on Napier see above site. In 1833, Captain Napier succeeded Admiral Satorius, in the command of Donna Maria’s fleet, and on 4th July that year, he achieved a signal victory off Cape St. Vincent over the more numerous and powerful squadron of Don Miguel, by boarding. In this action, the following was the relative strength of the two fleets. Donna Maria’s squadron, under Napier, three frigates, a corvette, and a brig, 176 guns in all. Don Miguel’s squadron, two ships of the line, mounting 86 guns each, a frigate of 52 guns, a 50 gun ship, three corvettes and two brigs, in all 372 guns. The result of this brilliant achievement was the evacuation of Lisbon by the Miguelites, and the establishment of Donna Maria on the throne of Portugal. For this important service he was created by the Portuguese government Viscount Capo San Vincente, and appointed admiral-in-chief of the Portuguese fleet. He also obtained the Grand Cross of the Tower and Sword; but receiving nothing but incivility and ingratitude from the Portuguese officials, he returned to England in the following November. In January 1837 he was awarded the Captain’s good service pension. it was a fun experience and if anyone lives near steve, it's well worth the trip. he's a very gracious host. Boy Steve - this thread gets more and more interesting every day. I love the stuff you post - thank you! Glad you're enjoying the new additions to the Mastiff Museum. I've just applied for welfare! If I had a boatload of cash, I would probably build a similar Moorish castle. That is a beautiful piece of architecture. Where is the Mastiff connection? A place like that begs for a herd of Mastiffs. If you go to the Historical thread (latest entry)you'll get a lot of detail on the castle. If you look closely at the figures in the photo, or blow it up, you'll see a 212 lb brindle Mastiff named Bingo at the entrance! That house suits him perfectly. Etching. 202 x 254mm. 8" x 10". Heywood Hardy [British Painter, 1843-1933]. Mastiff. Just restating the standing invitation to all who wish to see the collection & visit the museum. 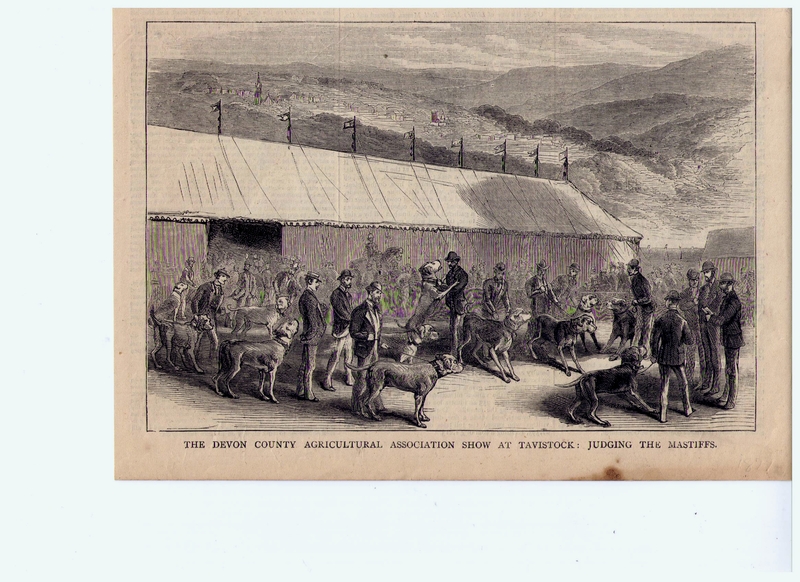 CAPTION PRINTED BELOW PICTURE: 'The Devon county Agricultural association show at Tavistock: Judging the Mastiffs'. One can see, that as early as 1877, Mastiff size & type were beginning to form a following of like minded fanciers. The Chromolithograph's color's seem awfully bright for something that is that old. Are you sure it isn't a reissue? It is beautiful. my friends print has the white area's actually painted in by the artists own hand. It is titled: Presented by A.
Woolmer, Grocer, Stroud. No, she would never sell it otherwise I'd be the first to make an offer. If you are referring to the image in #221, it is printed in 1909 and genuine. I'd love to see the image you're describing, as it could have been a prototype for the printing done in 1909. How is the date in your friend's piece placed? Is it written in by hand, or printed in the image? Typical modern reprints are smaller in size and printing techniques are of a different nature. Both old prints can be valid for their respective dates, but done by different printing methods. what looks like a calendar. In the lower margin is the name of A. Woolmer, Grocer, Stroud. It is quite large. margin. I am comparing yours to the one owned by my friend. I need new glasses so maybe the print is there? I believe the one my friend has was probably given as an advertising gift to customers. or to stop the mold from progressing. I know they do that with paperwork but I am not sure if they do it with photos. Steve, getting those stained glass windows was a real find! I also like the bronzes. Thank you for sharing. Arthur Woolmer was a grocer in Stroud England and the image was probably part of his advertising of a product. If I recall, Daisey was the name of the girl in the picture, but I can't recall the product related to the image. My only interest is in the dates, since modern reproductions are available on Ebay for 6.99 GPB. Either the date on the Bristol Robinson was incorrect, or your date is earlier and represents another printing. I'd still like to see the image you're speaking about Dixie. Perhaps you can post a photo with dimensions! I got mine from an antique dealer in England, of course I cannot find the paperwork that came with it, but it was advertised as an original print. There is a signature in the bottom right corner but I cannot read it. It is one I always liked but I did not want a modern copy. It is quite big and the frame itself is very old. I am so glad you bought this up, when it arrived it had tape all over it, when I looked at the photo I posed you can see it stuck on the glass. It is now pristine lol. Finally cleaned it up. But of course my camera died and I am waiting on a new one to arrive. There is a signature in the bottom right corner but I cannot read it. The location and printer's name (see earlier references posted). I'll see if my daughter can help me out with posting a picture. I never did take the time to learn how to do that. My friend bought hers from a local antique dealer many years ago...maybe 30 years ago now. Reveille Mastiffs. (spelling?) I bet you would have liked getting that piece. Went for about $2,000 if I remember correctly. She does sculptures and I am aware of the piece you've mentioned. Hope you can get that old print posted! That is just lovely Steve, beautiful piece. extra-large original antique print insert from an 1880s newspaper. It depicts a peaceful yachting cruise. 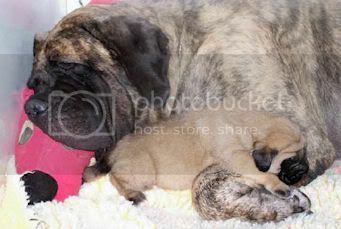 The family Mastiff dog is being doted on by two girls as others in the family relax. A parrot sits on the sail beam. Illustration by WH Overend. The page measures approximately 21.75 x 15.5 inches (55 x 39cm).